Last month, American Skillet Company hit a milestone along our journey as a new cookware company, and we finally reached the goal of exhibiting at the The International Home & Housewares Show at the McCormick Placein Chicago, Illinois last March. This trade show is one of the top 20 biggest trade shows in the country, and as first-timers, we came out with an amazing experience thanks to the wonderful International Housewares Association staff.. and our charming little booth pictured above. 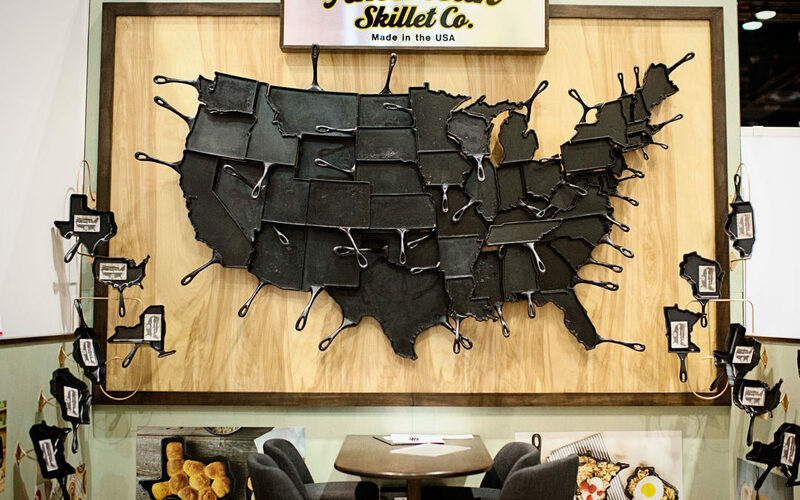 Out of 2,100 companies exhibiting at this Housewares show, American Skillet Company was one of 60 exhibitors specially selected to be part of an exclusive pre-show New Exhibitor Preview event for buyers. If that’s not awesome enough, we were also selected to show a selections of our wares inside the Media Center for duration of the show, which is open only to press and media relations who want a preview of what’s out on the show floor. What incredibly supportive feedback from global buyers, news media and other exhibiting companies at the show and reps.
To say that it was a staggering amount of work building and branding our first trade show booth, would be a resounding understatement. Between the design layout, mixing custom color stains, milling our lumber, building the walls, welding metal fixtures to display our skillets, choosing flooring, printing giant photos and finding adjustable chairs, (way harder than it ever could have seemed!! ), all of it was *totally* worth the experience and exposure that we had at this particular show. Process shots of the bones of our trade show booth walls being built in our seasoning shop, which put our production on halt for 1.5 months until the dust settled….literally. Andrew, our talented in-house carpenter and company co-founder, built everything from scratch! Truly a jack of all trades, Andrew worked day and night for 2 months solid building, directing, planning and designing everything involving our booth, so that it would easily ship on just 3 small pallets to the show. What a guy! Needless to say, it finally all came together with a seamless looking set up that had that hand-made kind of detail and charm written all over it. Inspired by dark and rich natural hues with a kick of modern art deco wall features, it was pretty flashy. For being a home-made booth, it did what it was supposed to do and helped attract retailer buyers, media and visitors to the show floor to come on over and meet us. With the big ‘ol FeLion Studios art piece map of the USA as the back wall, it was interesting to learn about who had heard about us before and who had not. At the very least, it was a quick way to explain our story to anyone new to us that weekend. We must have met over 2,500 people across those 4 days in Chicago, but there were a few people who really made a huge impression on us. Our favorite cast iron cookware rock stars made the trip over to our booth to hang out for a while, which was an incredibly wonderful treat! After talking about our company all day long, it was really nice to connect with our fellow American producers of cast iron cookware: Lodge Mfg and Finex Cookware. Both of these guys are some of the most awesome people you could ever find to meet! We are so lucky to be part of such a fun industry made up of salt-of-the-earth people like these two. The Iron Skillet Crew: Mr. Henry Lodge himself, alongside Mike Whitehead of Finex Cookware, and Alisa Toninato of American Skillet Co. in the middle. It was fun to hear about all the new developments each of our company’s are experiencing this year already, and chat about favorite foods, best cast iron care and maintenance advice, and just goof around a bit….okay A LOT ! Mike humored us by taking a classic photo by the big ‘ol map. All in all, we had a wonderful time truly meeting our industry, learning more about retail and trade show world, and making some amazing new friends and connections. The big news for us is that we came out of the show with 16 new retailers across the USA, including Bering’s in Houston, TX, Grebe’s in Wausau, WI, Kitchens in Eden Prairie, MN, and later this Fall, get ready to find us on the Gift Table online at Crate & Barrel !! We’re ever so thankful for all of the great support, interest and fun that we had the the International Housewares Show this year, and looking forward to coming back next year with new products and continuing to connect with more retailers that will help us to bring our products closer to YOU, your devoted and fun customers!